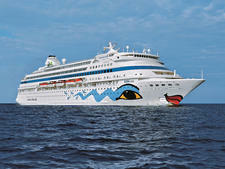 AIDAperla is a family-friendly ship designed for German passengers. 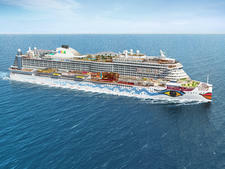 The 3,286-passenger ship, which debuted in 2017, is loaded with features for kids and adults alike to share and enjoy. It's got an enormous waterpark play area, indoor/outdoor pool, and activities like ropes courses, mini-golf and a sports court. It also features a large number of restaurants and a huge spa complex. It has numerous bars and lounges, a busy entertainment/theater hub at the center of the ship and cabin categories to suit any need (with an emphasis on rooms that can accommodate at least four people). About 95 percent of the passengers on AIDAperla are German-speaking, with most coming from Germany, Austria and Switzerland. All signs and menus, entertainment, shore excursions and announcements are in German. (Only important announcements, involving safety drills and embarkation/disembarkation instruction, are in German and English.) Crew speak German and English. Passengers are generally young families, especially during the summer and holiday seasons. You'll find a number of multigenerational families onboard, with grandparents, parents and children, along with a fair number of grandparents traveling with their grandchildren while mom and dad stay home. Passengers tend to be appreciative of the ship's laid-back vibe, which is heavy on fun and light on formality. 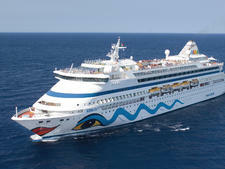 AIDAperla is designed for Germans and German speakers, so passengers who don't speak German or aren't comfortable on a ship created for a European passenger base should honestly consider whether the ship is the right fit for them. AIDAperla has a large number of cabins, ranging from the 172-square-foot inside cabin to a 1,238-square-foot suite. Many cabins accommodate at least four people. (While the double-occupancy capacity is 3,286 passengers, you might find your sailing has significantly more passengers because so many cabins accommodate more than two people.) All cabins include two twin beds that can be combined to form a European king-sized bed, canopy, TV, desk, bathroom with shower (some bathrooms feature a separate water closet), telephone and hair dryer. Balconies include a cool hammock that can be stretched across to enjoy some reading or snoozing. While cabins are comfortable and relatively spacious, amenities are somewhat bare-bones when compared with what you might expect when sailing lines more traditionally targeted toward North American passengers. Beds lack top-sheets, and washcloths are nowhere to be found. Cabins don't have refrigerators or vanities. The tradeoff is plenty of storage space and room to walk and lounge comfortably -- especially in balcony cabins, which feature full-sized couches. Junior suites and above come with a nice roundup of perks, including discounts at the spa, exclusive dining experiences, priority check-in. Suites further get access to the AIDA Lounge, an oasis away from the daily hustle and bustle; this lounge has indoor and outdoor seating, snacks, drinks (wine, water, soft drinks and some spirits), games and a concierge, who can handle virtually any need. Five of the restaurants on AIDAperla are buffet-style, and these are by far the most popular. Most are open for breakfast, lunch and dinner (but check your daily schedule to make sure). For the most part, these restaurants serve up German favorites and comfort food. That might include various pasta and meat dishes, potatoes, pickled fish, cold cuts and cheese. They also feature salad bars and dessert selections. Wine, beer and soft drinks are included in these venues at lunch and dinner, and people begin lining up for meals about 15 minutes before the restaurants open; they also tend to linger -- especially at dinner -- so finding seating can be difficult. The biggest buffet is Markt, which features the most variety of food and seating, with options indoors and out. East is the ship's Asian buffet restaurant, and it includes a Mongolian-style grill as well as a Pho soup station. Other buffet options are Bella Donna, Fuego and Weite Welt. The ship also has three for-fee specialty restaurants: Rossini, Sushi and the Steakhouse by Tim Malzer. These three are lesser visited than the buffet restaurants, but reservations are still encouraged. Rossini is a farm-to-table gourmet option priced a la carte, though there is also a six-course set-price chef's menu. AIDAperla has three restaurants that are free with the purchase of a drink. French Kiss offers French dishes, like escargot, consomme and duck. It's also open for a sit-down breakfast, when it's usually got plenty of seating. Make reservations for dinner. Tapas is a Spanish-style restaurant serving small plates of items like grilled octopus, honey-soaked chorizo and cheese-stuffed peppers, along with Spanish beers and sangria. For an authentic German beerhall experience, visit Brauhaus, a huge venue that offers bench seating at long tables. This spot features the ship's onboard brewery and a large selection of beers. It's open on sea days for lunch, when it offers dishes like roast chicken and sausage. For dinner, there's schnitzel, goulash and roast duck. This venue is hopping until late, with entertainment beginning after dinner, flowing beer and group singing. The ship also has some snack spots, like a curry wurst "food truck" and a build-your-own Magnum ice cream bar shop. There is no main dining room on AIDAperla. AIDAperla offers a good variety of bars and lounges. Spaces tend to be quiet during the day and heat up late into the evening. Passengers at all AIDAperla venues must be 16 years old to drink beer, 18 to drink wine and 21 to drink spirits. A favorite spot onboard is the Brauhaus, which serves food in the evening, then turns into an entertainment hotspot at night. The bar has a stage, and it will host events like karaoke and dancing. It's not unusual for passengers to stand on benches and sing along, a la Oktoberfest-style celebrations. The bar has an excellent selection of beers, including three brewed onboard. Another fun spot is the Nightfly nightclub, which hosts some entertainment -- and this comes with a small cover charge. Shows, which are open to adults only, have lots of options, with themes like "Paris, My Love" and "Close to You." The Beach Club, an indoor/outdoor pool space, hosts late-night parties with DJs and live bands. The heart of the ship's activities take place in the innovative Beach Club, which has an indoor/outdoor pool. The space is covered by a glass roof that can be opened (it also allows in UV light), and has lots of lounge chairs. The pool stretches to the outside space, where there is additional seating in lounge chairs and the like. Families spend lots of time here, especially in the climate-controlled comfort of the indoors. The ship also features a lazy river, water play area, waterslides and ropes courses, along with mini-golf, Ping-Pong and a sports court. Stadium seating allows parents to watch their kids play, though many jump in along with their kids. The ship features a tiny, lightly used casino, along with numerous shops featuring designer brands and logo items. The ship's main theater is called the "Theatrium," which is part theater, part atrium. Unlike traditional cruise ship theaters, which are enclosed and generally found at the front of ships, this one is smack-dab in the middle of the action. It also features no walls, so passengers just walking by can pause to take in the action. The stage itself is circular, and seating is in the round. It spans three decks, and passengers can watch the action on the stage or sit in booths and nooks nearby while watching on TVs. Entertainment takes place here throughout the day, and passengers drop by and leave as they please. Programming onboard includes activities like bingo, spa, flower design and art workshops, and sessions on cocktail making and winetasting. The Body & Soul Spa on AIDAperla is a popular spot on the ship. The highlight is the enormous thermal suite area, which includes sun loungers, hot tubs, ceramic lounge chairs, sun beds, water beds, steam rooms and saunas. For a fee, passengers can book the spa by the hour, half-day, day or full cruise. The sauna area is strictly natürlich -- clothing isn't permitted here. But bathing suits are fine in the rest of the spa. Two spa suites are available for rental; here, passengers can indulge in hot tubs, water beds, sauna and lounge chairs -- in private. Treatment rooms are available, where therapists provide massages, facials, scrubs and the like. A separate salon offers hair and nail treatments. The fitness center also is large and decked-out with the latest cardio and weight equipment. It's also fairly busy throughout the day (except early in the morning). Fitness classes, like spinning and yoga, are offered throughout the day. This ship is designed for families, from cabins that accommodate four-plus, to waterslides and ropes courses, and programming. Families are common onboard, and they tend to stick together, despite solid kids clubs with fun programming. 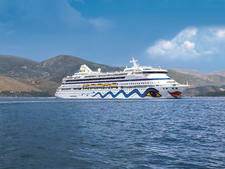 AIDAperla offers entertainment aimed specifically at families during the day at the ship's theater; it's not uncommon to see parents cheering for AIDA mascot, Dodo, alongside their kids. Kids clubs offer workshops, fitness programming, cinema nights, video games and crafting. Childcare is also available for children aged 3 to 17.